I haven't processed my photos from the total lunar eclipse yet, but here are a few straight out of the iPhone camera. 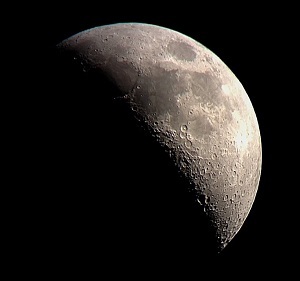 The method was digiscoping (holding the iPhone up to the eyepiece of a telescope). Who would have thought you could take blood moon total lunar eclipse photos with the iPhone camera! I also took some video that I'm going to stack in Registax for a cleaner image. I'll post those in a separate post when I have them processed. Here is information on the method for stacking from iPhone video.